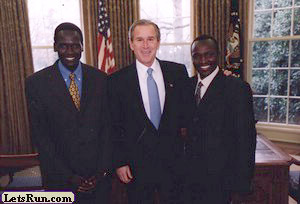 "Think of this American team - Bernard Lagat, Chris Solinsky, Matt Tegenkamp, Galen Rupp and Dathan Ritzenhein. The American dream team could take on the world's best and do very, very well. The only way it's going to happen, however, is if Nike decides to do a marketing campaign around it and pays them to run World XC. Two years from now, that team may not be as good as it would have been this year, and four of the five showed they are very fit within the last month. Too bad they didn't do it this year, but hopefully some Nike Marketing Exec is reading this." 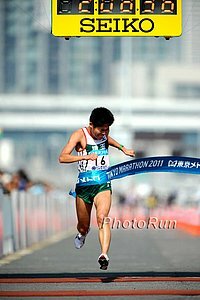 - From the LetsRun.com "Week That Was In Running" for last week, talking about how the US could perform well at World XC if we actually brought our top runners and how Nike needs to put this together. On their front page XCnation.com quoted us and proclaimed: "Letsrun.com posted the greatest week that was all-time." What are the unspoken rules of running? Do you think Lance Armstrong will ever admit to doping? When did a 3-hour marathon become something to brag about? MB: Stanford mens 1500m RESULTS. No Fernandez. Does Mississippi State's New Track Have A Bank? "The nine-lane track has lanes that are a half-foot wider than typical lanes and have an engineered slope in its turns to aid in building/maintaining speed in the corners." Las Vegas 5k: Flat, Fast, Cash 5k One month from now, you could be in beautiful Las Vegas not only hitting the strip and enjoying the great Vegas springtime weather, but also running a fast, flat 5k with a $5,000 cash purse. Sign up now and get a swag bag. Click here to read more about the Las Vegas 5k. "Blade Runner" Hits 400m Olympic "B" Standard Oscar Pistorius continues his quest to become the first double amputee to compete in the Olympics by running a PR of 45.61 (his previous best was 46.02), which gives him the 2011 outdoor world lead. Usain Bolt & Tyson Gay Probably Will Not Race Until World Champs And apparently UK tax laws are partially to blame. 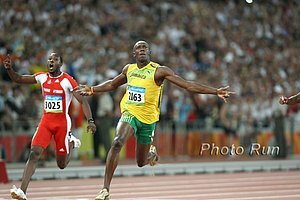 Tyson Gay is racing in London and Bolt would like to as well, but UK laws would tax him a ridiculous amount if he did. 2 Months Away In Rome: Asafa Powell Vs. Usain Bolt At 100m, Sanya Richards Vs. Allyson Felix At 200m AND 400m Three cheers for stars racing one another. US Sumo Wrestle Champ Sets WR As Heaviest Person To Finish A Marathon He ran 9:48:42 ... that's 22:27 a mile. Jack Daniels Gives Free Running Clinic In Pennsylvania Daniels focuses ont not "overdoing it" and knowing the purpose of every run. 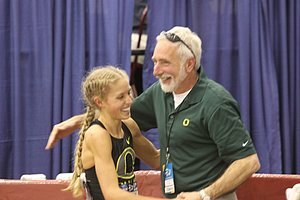 RRW Interview: Tom Raynor, Chariman & CEO, Fleet Feet Inc.
Pre-1981 Oregon Women Athletes To Receive Long Overdue Varsity Letters From back when Title IX was more than just an excuse to cut cross-country/track programs. Zazzle To Sponsor 100th Bay To Breakers! 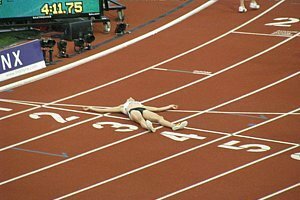 *Universal Sports Examines Ryan Hall's Half In New York The article doesn't say this, but in training for a marathon, Hall shouldn't run a half if he's going to go out too fast and die. Kim Smith Does New Bedford Half Marathon In 1:09:50 Instead Of Running NY Half Good idea for her to not get carried away and try to race too fast when her focus is on the Boston Marathon. Mo Farah Gets Win & Caroline Rotich Gets Course Record But Galen Rupp Steals The Headlines In his half marathon debut, Mo Farah won a 3-way sprint with Gebre Gebremariam and Galen Rupp as he took the victory in 60:23. Rupp made waves early by wearing a mask, then falling down, but then made way bigger waves late with his legs as he got faster each 5k (15:05-14:27-14:04-13:53) to became the 5th-fastest American in history thanks to his spectacular 60:30 debut. The "old guard" of US men's distance running didn't do nearly as well, as Meb Keflezighi ran 62:52, Abdi ran 63:12 and Ryan Hall was way back in 63:53. But the "old" woman, Kara Goucher, was great as she ran 69:03 to get third (remember she ran 74:02 in January). *Telegraph Recap: Mo Farah Wins His Half Marathon Debut In New York Afterwards, he says Salazar has him in the best shape of his life. *Mo Farah’s NYC Half Victory Set A UK National Record, But IAAF Refuses To Count It Scroll down the page and you will see that the IAAF refuses to accept times from the NYC course because it is "slightly downhill". 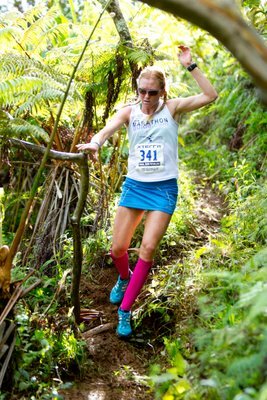 Big Sur Marathon Forced To Modify 2011 Course When A 60ft Section Of The Highway Fell Into The Pacific Ocean Apparently this has happened before. Academic Says There Is No Proof Success In Sports Is Genetic To young aspiring athletes he would like to say: "I would say to them - all of them, including the white kids - 'Go into sprinting. Don't worry because you're white. It's got nothing to do with the colour of your skin.'" Optimistic attitude, but someone might want to tell him that only one white man has ever broken the 10-second barrier in the 100m. USA Today: Ralph Nader Calls For An End To College Athletic Scholarships He says he wants to "address the myth of amateurism surrounding big-time college football and basketball in this country" and help reduce the "win-at-all-costs" mentality in high schools by reducing the incentive of college scholarships. 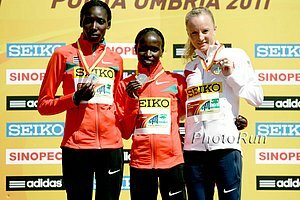 Vienna Marathon: Peninah Arusei And Ana Dulce Felix To Debut Kenya's Arusei won bronze at the World Half Marathon Champs and has a PR of 67:48, while Portugal's Felix has a PR of 68:33. Wildlife Photographer Paul Goldstein Plans To Run Four Marathons With A Tiger On His Back He will run 4 marathons in one week to try to raise more than £30,000 to protect the Bengal tiger, one of the world's most endangered animals. Video With Christophe Lemaitre Explaining How To Run The 100m Want to run the 100m? The first white man to break the 10-second barrier shows you how. Lance Armstrong Having Alberto Salazar Coach Him In Running For Ironman Lance discusses the possibility of winning it. And the easiest way to get hate emails is to link to something like this: Do you think Lance Armstrong will ever admit to doping? *Daily Telegraph With An In-Depth Look At Paula Radcliffe Radcliffe's career has been amazing with 5 of the 6 fastest marathons ever. She is now focused on one thing - London 2012. 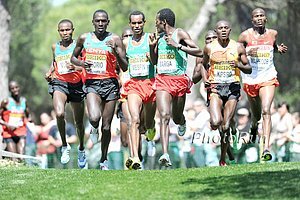 Simon Bairu Gives Glimpse Into What Runners Can Expect At Sunday's World XC Championships Bairu won't be racing this year, but was an impressive 12th last year. Recommended Watch Interview With 21-Year-Old Robertson Twins Of New Zealand They left home at age 17 to live and train in Kenya and haven't seen their parents in 4 years! One has a PR of 3:44 in the 1,500 and the other a 5k of 13:32 and they will both be racing in Spain on Sunday. Last Rites For World Cross-Country? Kenya Ready To Hit Hard At Worlds Team looks deep considering all 4 individual title winners from last year failed to make the team. US XC Team In-Depth: XCNation.com has a 4-part series on the US team.